Mechanic's Creeper offers comfortable, ventilated design. Featuring dog-bone shape that cradles user between wheels, Bone-ster(TM) is molded of one-piece engineering-grade copolymer and measures 43 x 23 3/8 in. with 300 lb capacity. It provides 1Â¼ in. ground clearance and is resistant to gasoline, oil, and most solvents. Wheels are 3 in. dia with oil-impregnated metal center bearings and molded-in-place 7/8 in. wide tire. Heavy gauge, cad-plated steel caster frames have dual race ball bearing swivels and each one is thru-bolted to body. Bone-ster(TM) Creeper is Comfortable, Affordable and Guaranteed! Kent, OH, USA-The "Bone-ster(TM)" mechanic's creeper is the more affordable younger brother of the original "Bone(TM)" auto creeper that revolutionized working under a car, and it's so comfortable and easy-to-use that you'll wonder why all creepers don't work this well! The first thing you notice about the "Bone-ster" is a strong family resemblance, the patented dog-bone shape that cradles the user between the wheels, about 1-1/4" above the ground. It's a proven design that's more durable, more comfortable, less likely to tip and easier to work on than any other creeper on the market. The second "Bone-ster" feature to catch your attention is the good looking one-piece body that's molded of the same special engineering-grade co-polymer as the original Bone-smooth, comfortable, easy to clean, resistant to gasoline, oil and almost all common solvents, and covered by a limited one-year warranty. 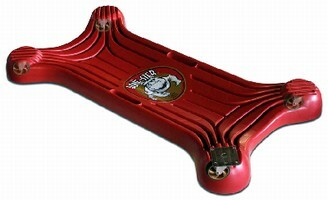 The deep, smoothly molded structural ribs add incredible strength and durability without adding bulk & weight, and provide welcome ventilation for those hot muggy days when lying on a vinyl pad leaves you with a sweaty back and a bad attitude! Two molded-in handholds make it easy to carry and easy to secure against theft or serial tool borrowers. Best of all, the "Bone-ster" solves the most common creeper complaint - wheels that break! Every "Bone-ster" features incredibly strong, custom-molded wheels that are guaranteed for as long as you own the creeper! Wheels are 3" dia. with oil-impregnated metal center bearings and a molded-in-place 7/8" wide tire that resists oil, gas and most common solvents. Using this advanced technology the tires form a strong molecular bond to the wheels, essentially becoming a strong one-piece wheel. Heavy gauge, cad-plated steel caster frames have dual race ball bearing swivels and each one is thru-bolted to the body with four 1/4" dia. bolts that won't ever tear off, strip out or fall apart. The "Bone-ster" body is 43" long, 23-3/8" wide, has about 1" ground clearance and weighs in at about 16 lbs., has a 300 lbs. capacity and a large body-support area that's even comfortable for users who may be in the "big & tall" category. The wheels are warranted for the life of the creeper, and the body carries a limited one-year warranty. The Bone-ster is available now from major auto, industrial and truck tool & equipment dealers, as well as leading tool catalog outlets worldwide.